Windows Phone welcomed a new member to the family today with LG's first Windows handset in five years, the Lancet. And yes, it looks exactly like the leaks. The LG Lancet, available at Verizon in the US, makes no qualms about being a budget device. It runs Windows 8.1, not surprising since Windows 10 Mobile isn't widely available yet. Cortana comes along as users' own Siri-like personal assistant. 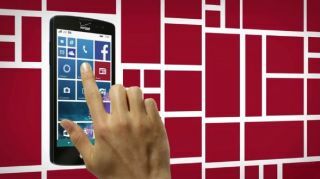 Naturally the Windows Phone tile UI finds a home on the Lancet's 4.5-inch LCD display, and apps and contacts are pinnable for easy access. It features an 8-megapixel rear camera with several shooting modes yet a low-end VGA snapper on the front. The phone is powered by a 1.2GHz quad-core processor and stays running thanks to a 2,100mAh battery. Rounding out its specs are 8GB of internal storage and support for a sold-separately 128GB microSD card. Best among its attributes is something Verizon is referring to as Advanced Calling 1.0. Verizon claimed the Lancet is the first Windows smartphone in its lineup to tap into higher-quality voice calling through this feature. The phone is also XLTE ready, which is Verizon marketing-speak for the speedier parts of its network. The Lancet is available online now and will be in Verizon stores starting May 21. It retails for $19.99 on a two-year contract, or $120 full price. Verizon Edge customers can get away with paying only $5/month for 24 months for the handset.